The LGBT people coalesced into our modern community largely due to our problematic relationship with the police. Most of our people know the place in our development that the Stonewall Riots in 1969 holds. 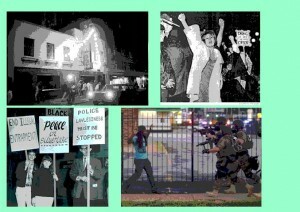 Far fewer know about the Compton Cafeteria Riot in San Francisco in 1966 and fewer still know about the Cooper’s Donuts riots in Los Angeles in 1959. In all three incidents, “outlaws” – transgender people, drag queens and others who could not hide, or chose not to hide – fought back against police overreach, harassment, and even violence. From each incident, more people were drawn into the struggle that got us to where we are now. Here in San Diego, it’s hard to recall the “bad old days” before the Human Dignity Ordinance, Sheriff’s LGBT Advisory Board, and all the other infrastructure designed to assure equal protection under the law. The sad fact though, is that in many places (both outside and inside the United States) – and for many other groups – we haven’t progressed very far from those days. Ferguson is an LGBT issue. Leaving aside the thought processes that could cause a grand jury to fail to indict a police officer who shot an unarmed African-American ten times, the police militarization and the profiling of a group of people that are “other” than the vast majority of law enforcement is right out of the pages of our history. Perhaps even more importantly, much of our progress as a community stands on the shoulders of the Civil Rights movement that both predates our struggle and, in many ways, lags behind it. I’d guess that you figure here is where I will throw in the “No one is free when others are oppressed” quote. I think a better quote comes from Teddy Roosevelt. “No man is above the law and no man below it.” While you can’t legislate away an individual’s prejudice, we have seen the miraculous changes that have occurred here and elsewhere when police are asked to live up to their mission to equally “Protect and Serve” all residents of their community. The time has come for the Federal government to step in where local government has failed. Investigation into civil rights violations were suspended while the local prosecutors/grand jury considered charges. That phase has ended (badly) so the Justice Dept. must step in. Only with justice will there be peace. More importantly, Federal policies that allow local law enforcement to become a militarized occupying force rather than community police must be halted and reversed. It’s awful that police action and reaction has led to what is occurring in Ferguson today. It would be unspeakably awful if we don’t use what is now occurring to make things better. A police force that looks like the community it serves does a better job than one that does not. Outcomes are better when police work with the community rather than lobbing tear gas from armored vehicles at them. The call from our community to our government is simple: Stop contributing to the problem. Start to fix it. Resposted from the San Diego Democrats for Equality with permission.